The distinction among seasonal produce is often lost in today's world of refrigeration and hothouse-grown fruits and vegetables, but everything becomes ripe in one particular season — a time when it's ready to eat without the help of anyone other than Mother Nature. Fruits and vegetables are just better from both a nutritional and taste perspective at this time. Here's what you'll find in our Greek farmer's markets in each season. Carrots, parsnips, and potatoes ripen in the cold of December, as do broccoli, Brussels sprouts, beets, cabbage, cauliflower, celery, chard, chicory, dill, fennel root, leeks, parsley, rutabaga, romaine, and spinach. All these vegetables can remain in their prime through most of January and February. Add artichokes to the list of vegetables that ripen in February, as well as endive and rutabaga. Fruits that peak in January include apples, avocados, Clementines, grapefruit, lemons, olives, oranges, and tangerines, with pears getting an earlier start in December. Technically, an avocado — like the tomato — is a fruit, although many consider both to be vegetables. As for olives, this is a bit tricky. They're fully mature in January, but they're often harvested as early as October while they're still green. Apples are no longer at their best in February unless they've been refrigerated from an October harvest. Almonds, chestnuts, and walnuts are in season in January and February, with dried figs and hazelnuts making an earlier debut in December. The same holds true for April, but a few more vegetables become ready for optimal harvesting now, including broad (or fava) beans, zucchini, and green onions. April marks the end of the season for rutabaga. Asparagus and broccoli are reaching the end of their prime season come May. Fennel leaves — as opposed to fennel roots — are ripening now, as are green beans, radishes, peppers, vlita (or Palmer amaranth), and some immature cucumbers, eggplant and melons. May is berry season, too: Fresh, juicy loganberries, raspberries and strawberries become available. Loquats, Valencia oranges, and apricots are ripe in May, and pistachios from the island of Aegina reach their prime in this month as well. 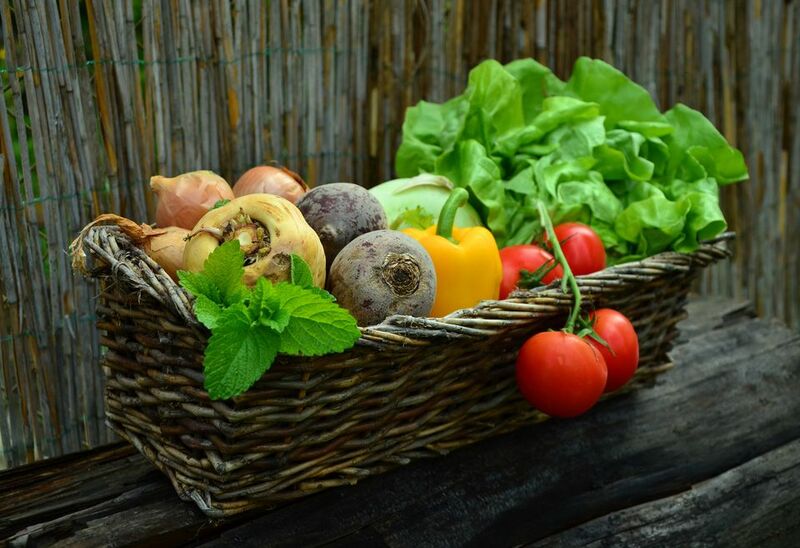 June is the best time for cucumbers, eggplant, beans, garlic, green onions, parsley, peas, peppers, potatoes, radishes, spinach, tomatoes, and vlita. Zucchini is still good. Sour Morello cherries, watermelon and pears make the scene. Come July, okra, summer squash, figs, nectarines, and peaches reach their peak, and plums ripen at the end of the summer months in August. Although autumn is the traditional harvest season in the U.S., it's the opposite in Greece — at least in early autumn. Much of the bounty of the late winter and early spring months has ended by September, although you'll still find eggplant, okra, root onions, potatoes, purslane, tomatoes, and zucchini available at their ripest point in this month. Apples, figs, grapes, melons, and plums remain in season as well. Walnuts are still good, as are the pistachios from Aegina. The situation perks up again in October, although it's the end of the season for vlita. Cucumbers begin ripening again, as do dill, endive, fennel leaves and fennel roots, beans — both fresh and dried beans are available now — root onions, peppers, radishes, romaine, rutabagas, tomatoes, zucchini, apples, and grapes. Some fruits are at their best at this time of year, including apples, grapes, kiwi, persimmons, green olives, quince, and pomegranates. By December, much of the bounty you can expect in January is already starting to reach to reach its peak.